If you’re looking for road sweeper hire in Leicester, look no further than Go Plant Fleet Services. We have an unrivalled fleet of high specification road sweeper hire vehicles available for hire and we have more than 40 years’ industry experience, making us the UK’s leading supplier of road sweeper hire. Whether you’re a small business, or a large local authority, we have a sweeper solution to meet your exact needs – all at a competitive price. At Go Plant Fleet Services we take great pride in providing all customers with a first class service, no matter how big or small your project may be. We offer a range of sweeper options when it comes to road sweeper hire in Leicester, including short term hire packages, contract hire and the option to choose between our operated hire service or a self-drive package. Should you choose our operated hire service, you will benefit from one of our highly trained and experienced drivers working with you. Every member of our team knows our vehicles inside and out and can help you to get the most out of your package whilst delivering exceptional results on time. We understand that your project may need to be completed to a strict deadlines so for this reason, our road sweeper hire in Leicester is supported by our 24/7 fleet support to ensure that if you do happen to run into problems, we can have the issue resolved quickly and with minimal disruption. Our team are highly trained from our advisers to our mechanics and we also offer a repair and maintenance service for both our own and third party vehicles. Home to the UK’s leading high specification road sweeper vehicles, with road sweeper hire in Leicester from Go Plant Fleet Services, you can rest assured that you will be equipped to deliver an exceptional service which is efficient and thorough. Our pedestrian sweepers are one of our most popular hire options; small and easy to manoeuvre, with one of our pedestrian sweepers you can deliver effective road sweeping without the imposing nature of our large sweepers. Our larger road sweeper hire in Leicester, consists of 7.5 tonne and 15 -18 tonne vehicles. These are perfectly suited for use on industrial projects and for highway maintenance. They’re equipped with LH steering, reverse alarm and full beacon package to ensure they’re operated safely. 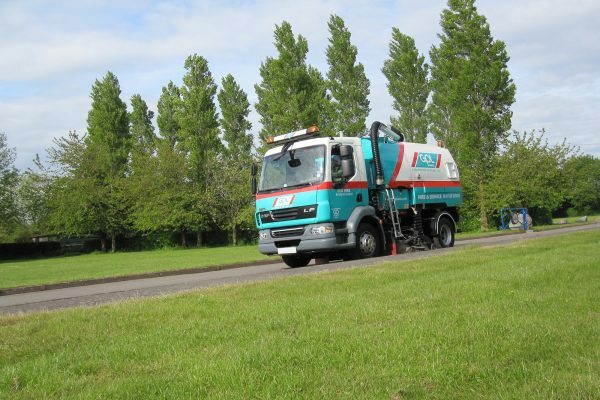 In addition to providing large road sweepers and pedestrian sweepers as part of our road sweeper hire in Barnsley, we also supply gully emptiers, refuse collection vehicles, cage tippers and other specialist services. The success of Go Plant Fleet Services stems from us working closely with our customers to provide bespoke road sweeper hire solutions. To request a quote or to find out more about our road sweeper hire in Leicester, please do not hesitate to contact us. Our head office and closest service centre in Ibstock services the entire Leicester area, and this ensures that you get a fast and efficient response when you need it most.